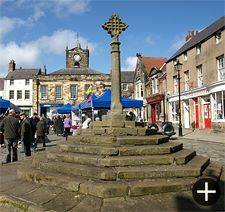 Alnwick (pronounced 'Annick') has been an important commercial centre since the 13th century and it is still the main town in this part of Northumberland. 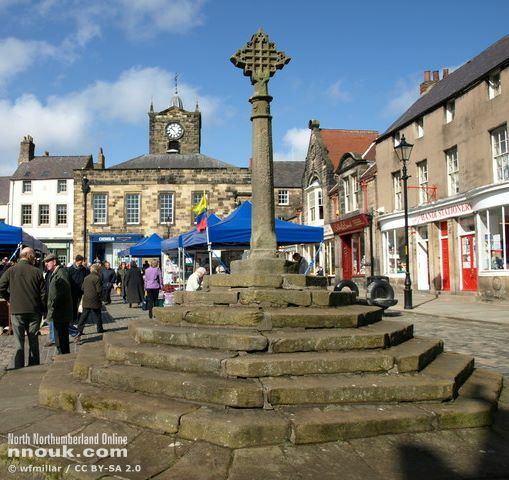 Much of Alnwick's medieval character survives intact: its narrow winding streets, town walls and market place. One tradition is the annual Shrove Tuesday football match which begins with the ball being thrown from the ramparts of Alnwick castle. And, every summer, the past is brought back to life during the Alnwick Fair, when local people don period costume for a week and some unlucky volunteers end up on the ducking stool. Alnwick castle occupies a strategic position on the banks of the River Aln. 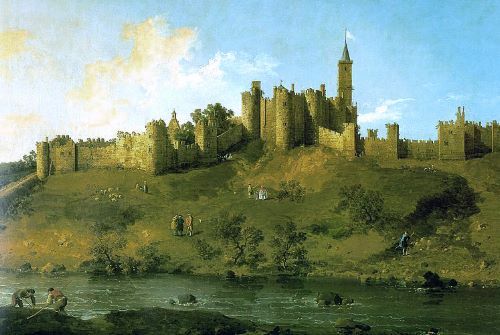 Dating from the 11th century, with restoration and alterations in the 18th and 19th centuries, the castle was painted by Canaletto (below), Van Dyck and Titian. In modern times it has become a popular film and TV location, featuring in the BBC's production of Dracula and Black Adder, and more recently as Hogwarts School in the Harry Potter films. 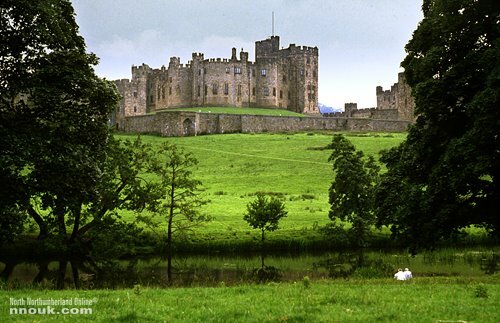 Alnwick castle is home to the Duke and Duchess of Northumberland and is open to the public in the spring and summer. Its latest attraction is its 26 acre water garden. 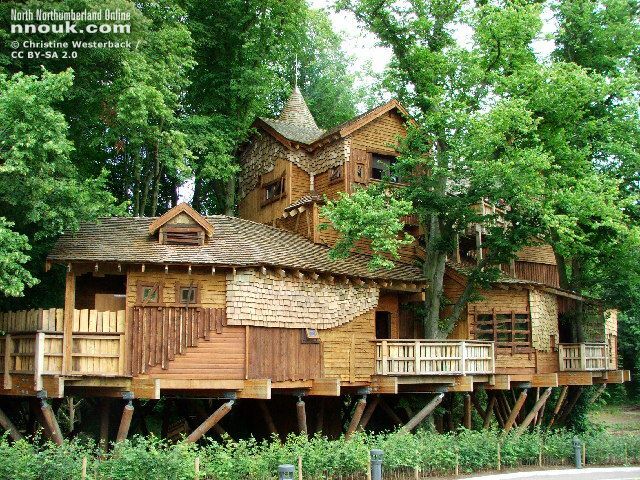 This cost £15m to construct, with 65,000 plants and shrubs, spectacular water displays and a giant tree house. The countryside near Alnwick. 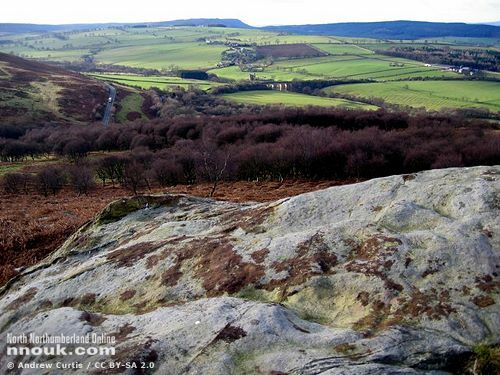 View from the roof of Corby's Crags Rock Shelter. © Andrew Curtis / CC BY-SA 2.0. © Gordon Hatton / CC BY-SA 2.0. 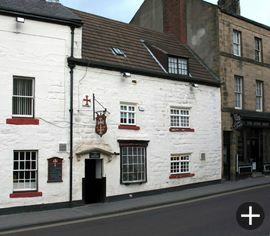 One of the more bizarre sights in Alnwick is a row of old bottles in the window of Old Cross Inn in Narrowgate. The bottles have remained untouched for more than 200 years due to a superstition which says that anyone who disturbs them will die. 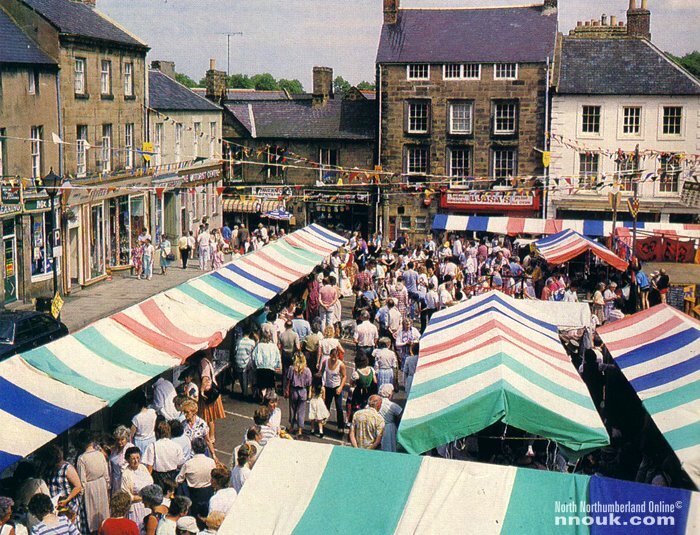 Watch scenes from colourful Alnwick Fair in this 90-second archive film from 1988 which is exclusive to NNOuk.com. Including the infamous ducking stool! All of the 'victims' are volunteers. This clip is taken from Super 8 movie film and has no live sound. 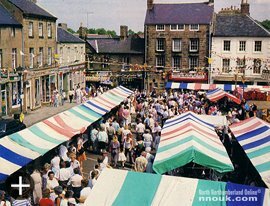 Alnwick Fair was held each summer from 1969 to 2007. Currently there's a range of festivals, shows and other events in the town throughout the year. Plans are afoot to reopen the railway between Alnwick and Alnmouth, which closed in 1969. Read more here (external site) . Alnmouth is a stop on the east coast mainline.